The last thing most businesses want is more government regulation. Don’t count those working on the autonomous vehicle among them. 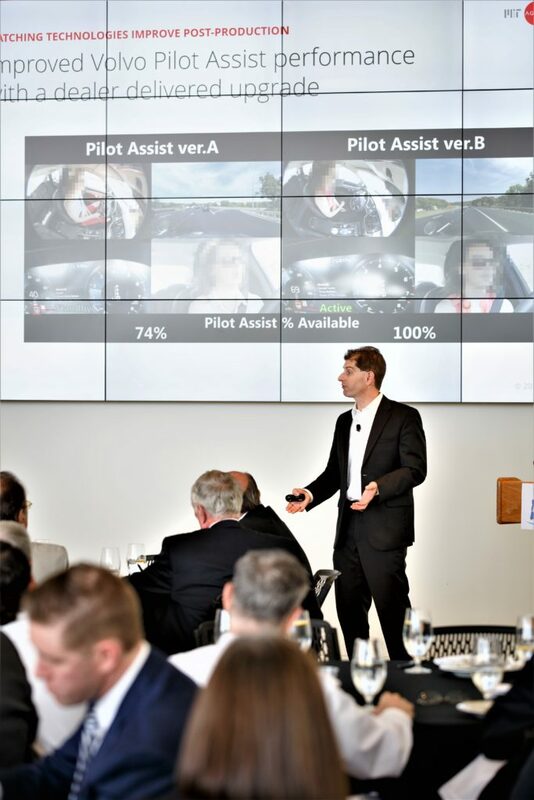 “We need ‘Policy Help,’ ” says MIT researcher and administrator Bryan Reimer Ph.D.
Bryan Reimer, Ph.D – Research Scientist in the MIT AgeLab and the Associate Director of The New England University Transportation Center, delivers the keynote lunch at the 2018 NEMPA MIT Technology Conference at the MIT Media Lab on May 30th. Reimer was the keynote speaker May 30 at the 8th annual NEMPA MIT Technology Conference at the university’s Media Lab. 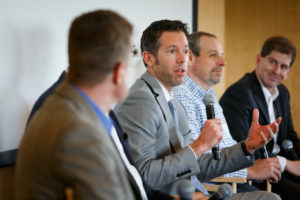 This year’s panel discussion with Reimer and four government and industry representatives was more about “making it all work,” how municipalities can work with the technology companies and how software and AI (artificial intelligence and machine learning) can fit into the new age of transportation and mobility. Joining Reimer were: Kris Carter, co-chairman of Boston Mayor Marty Walsh’s office of New Urban Technology; Luke Fletcher, senior manager of the Toyota Research Institute (TRI); Sanford Russell, senior director of Nvidia’s North American autonomous driving ecosystem; and Peter Secor, vice president of product marketing and business development for Cambridge-based Humatics, a MIT-related startup company specializing in microlocation technology. “All [companies working on autonomous vehicles] have a secret sauce that works, but which also is missing elements,” says Reimer, who was the keynote speaker at the luncheon preceding the panel. Meanwhile, for every advance, more questions arise. “Today, government agencies mandate recalls based on hardware defects; but new cars are being built around software. Should autonomous vehicles have their own regulatory structure?” asks Reimer. Carter says that car-sharing and road-sharing are vital to Boston’s future. “Our population, 560,000 in 1980 will be about 790,000 by 2020. Our roads aren’t growing. And we have a huge income inequality in the city. We must figure out how to infuse bicycles and pedestrians into the mobility structure. And there also is no single solution. 2018 NEMPA MIT Technology Conference panelist from left to right: Peter Secor – Product Marketing & Business Development – Humatics, Sanford Russell – Senior Director of Autonomous Driving Ecosystem, North America – Nvidia, Kris Carter – Co-Chair of the Mayor’s Office of New Urban Mechanics, Luke Fletcher – Senior Manager, Toyota Research Institute, and Bryan Reimer, Ph.D – Research Scientist in the MIT AgeLab and the Associate Director of The New England University Transportation Center. Humatics has developed fixed-beacon technology with sensors on poles and buildings to guide autonomous vehicles in urban areas. Nvidia, which started as a gaming platform, now is working on AI to build a massive database of machine learning so an autonomous vehicle can sequence Perception-Reasoning-Action to drive on its own. Solutions can affect our lifespans. “AAA research shows that the longer people are able to drive, the longer they live,” says NEMPA president John Paul, who moderated the panel. That melds with Toyota’s goals. Akio Toyoda, president of Toyota, has a goal of keeping an aging population mobile, one of the driving factors in creating the TRI. “We’ve partnered with MIT, Stanford, and Michigan in our research,” says TRI’s Fletcher. Toyota has two autonomous programs, Guardian and Chauffer. All of which gets us to the intersection where all these interests collide. Coming are Levels 4 and 5 of autonomous driving. Level 4, a driverless vehicle “working” in a fenced geographical area, such as university or airport grounds, will be first. Level 5 remains an elusive goal. Reimer predicts it will be the entity with the deepest pockets that is able to stay the R&D course. Among companies, that appears to be General Motors.